The mobile robot MANFRED-2 is a mobile manipulator whose purpose is to serve as experimental platform for R&D in the mobile robots area. It has been designed to operate efficiently in environments where human manipulation capabilities are required. 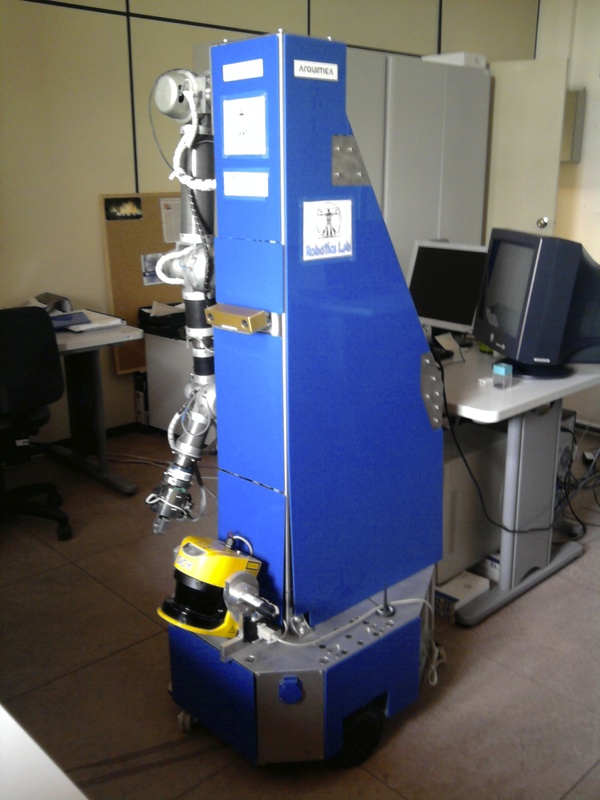 The mobile robot MANFRED-2 (MAN FRiEnDly mobile manipulator) is a mobile manipulator whose purpose is to serve as experimental platform for R&D in the mobile robots area. It has been designed to operate efficiently in environments where human manipulation capabilities are required. MANFRED-2 must be able to navigate autonomously in an environment typically composed of a corridor and offices. The robot design is inspired by planetary rovers and communications satellites. These systems are composed of several subsystems that need to be interconnected to make the whole system work. These subsystems are: onboard computer, power distribution system, sensors, drive system, etc. More instruments to explore the surroundings, such as articulated arms, can also be implemented depending on its application. MANFRED-2 has at most eight DOF. It is composed of a differential-type mobile base with two DOF and an anthropomorphic light arm with six DOF. It can execute multiple tasks. The most typical ones are opening and passing through doors, obstacle avoidance, and picking up and manipulating objects. In order to do that, the robot needs all the basic capabilities to move safely and independently around the environment, motor coordination between the base and manipulator, and sensory coordination to manipulate objects. Book Ph.D. Thesis: Evolutionary-based Global Localization and Mapping of three-dimensional environments. Directors: Luis Moreno Lorente, Santiago Garrido Bullón. February, 2012.